At Rubrik, we are focused on architecting a complete enterprise data management platform from data center to cloud. The Rubrik Alta 4.0 release furthered this vision by rounding out support for the key modern physical and virtual environments in the enterprise with Microsoft Hyper-V and Nutanix AHV support, instant recovery for SQL Server, native Oracle data management, and CloudOn instantiation services for AWS. With Alta 4.1, Rubrik CloudOn instantiation services now support both AWS and Azure. Enterprises can now instantiate VMs in Azure (in addition to 4.0 CloudOn support for AWS) through a “server-less” conversion of VMs to cloud instances for cost-efficient disaster recovery and test/development. CloudOn instantiation lowers costs of such use cases by utilizing cloud services only when needed. Enterprises can now mobilize apps across data center to cloud. 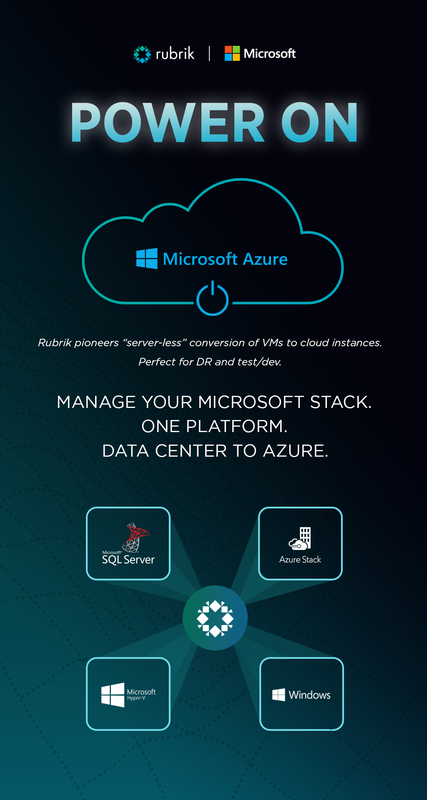 Rubrik provides a single platform to manage your entire Microsoft stack: Azure, SQL Server, Hyper-V, Azure Stack, and Windows. This means customers enjoy a unified user experience, regardless of where the data resides. Use our rich RESTful API suite to create custom lifecycle orchestration workflows across your Microsoft ecosystem. We’re also excited to be one of the first data management solutions to support Microsoft’s new private cloud offering, Azure Stack. Azure Stack delivers Azure services to on-premises environments for building hybrid cloud applications. With Rubrik, users can easily mobilize applications from Azure Stack to Azure and accelerate test/development of on-premises and cloud applications. Alta 4.1 also deepens our cloud offering by adding cloud archival for all classes of Google Cloud Platform (Nearline, Coldline, Multi-Regional, and Regional). Rubrik delivers a true multi-cloud data management solution, enabling customers to easily migrate data to any cloud of choice. Enterprises can orchestrate application data across any public or private cloud for long-term retention. Federal, state, and local agencies use Rubrik to securely manage data from data center to cloud. Alta 4.1 broadens support to all government infrastructure offerings from AWS – we now support AWS C2S in addition to previously supported AWS GovCloud. Federal agencies and commercial contractors can leverage AWS government offerings for use cases such as long-term retention, disaster recovery, test/dev, and cloud-native data protection. We’re also adding support for AWS Glacier, completing support for all AWS storage classes for archival. Automate data archival to Glacier to fulfill legal and compliance requirements. With one click, enable Vault policy for Write-Once-Read-Many locked archive on AWS for strict regulatory and compliance controls. Rubrik bolsters management security for multi-tenant organizations—such as Service Delivery Partners and enterprises delivering IT-as-service — to add secure, exclusive access to data management services in a hybrid cloud environment. Isolate application data to provide granularity at the object level (VMs, SQL databases, Windows and Linux hosts, NAS shares, and Oracle Managed Volumes) and management level (SLA domains, fileset templates, archival locations, replication targets, and APIs). With Alta 4.1, administrators can accelerate the delivery of protection policies, recoveries, and analytics reporting across a multi-cloud environment. At the core, Rubrik works to solve enterprise data management pain points with a cost-efficient and future-proof solution. Alta 4.1 enables customers to free their data from underlying infrastructure, enjoy rich self-service, and power on applications in a multi-cloud world. [UPDATE] As of March 19, 2018 Rubrik Alta 4.1 is now generally available to all customers.